Few halls, gatehouse and old Škoda in front of it. Few halls and 180 000 pullets inside. So many crippled lives. The night is dark and chilly. Sentry gives us a go. We follow the fence. Slowly, quietly. Once inside amidst cages, we light up our headlamps and prepare our bags. I open cages and pull out some of those little girls. We are out in few minutes. 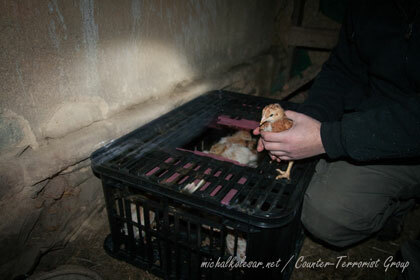 Thirteen chicks with us. Few days ago, my friends told me about your illness. I just want to wish you lots of strength and lots of love. There is a piece of you in each of my rescues.